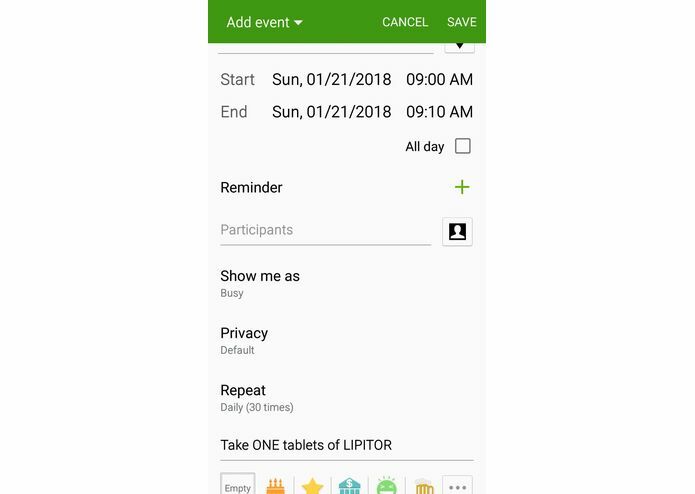 Android app that helps you never forget about taking your medications without having to fill out unnecessary details! Automation is at its peak when it comes to technology, but one area that has lacked to keep up, is areas of daily medicine. We encountered many moments within our family members where they had trouble keeping up with their prescription timelines. In a decade dominated by cell phones, we saw the need to develop something fast and easy, where it wouldn’t require something too complicated to keep track of all their prescriptions and timelines and would be accessibly at their fingertips. 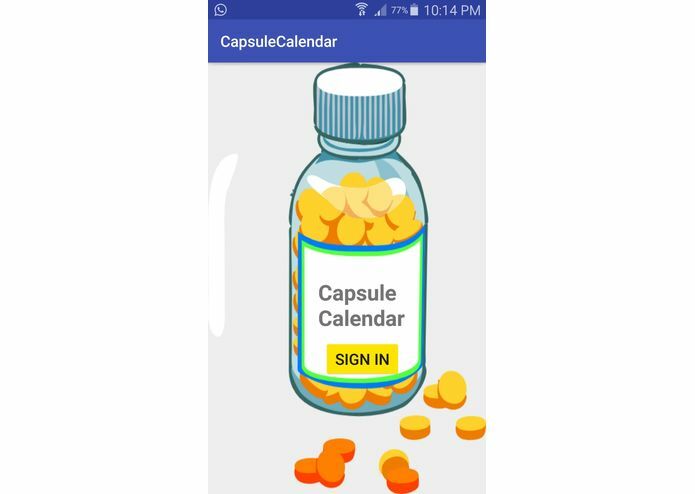 CapsuleCalendar is an Android application that lets one take a picture of their prescriptions or pill bottles and have them saved to their calendars (as reminders) based on the recommended intake amounts (on prescriptions). The user will then be notified based on the frequency outlined by the physician on the prescription. 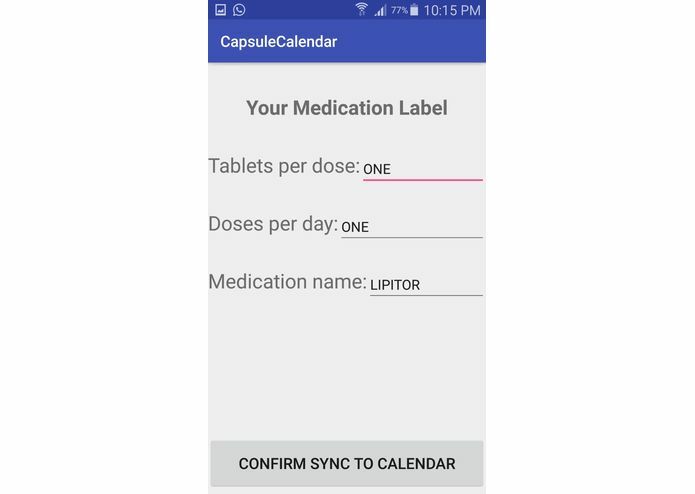 The application simply requires taking a picture, its been developed with the user in mind and does not require one to go through the calendar reminder, everything is pre-populated for the user through the optical-character recognition (OCR) processing when they take a snap of their prescription/pill bottle. The application was built for Android purely in Java, including integration of all APIs and frameworks. First, authorization of individualized accounts was done using Firebase. We implemented and modified Google’s optical-character recognition (OCR) cloud-vision framework, to accurately recognize text on labels, and process and parse it in real-time. 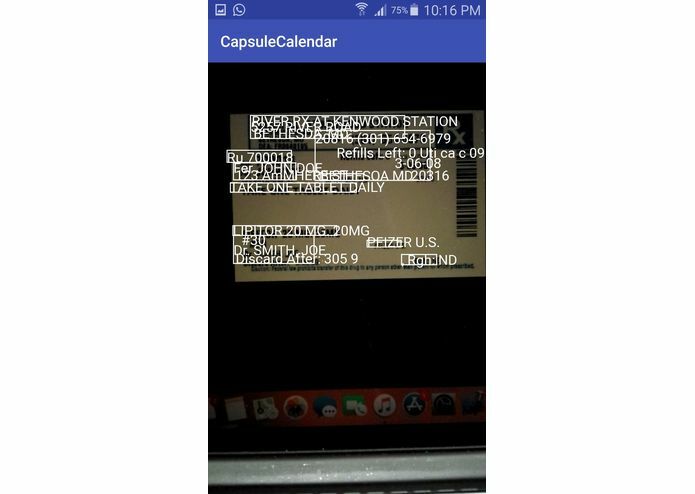 The Google Calendar API was then applied on the parsed data, and with further processing, we used intents to set reminders based on the data of the prescriptions labels (e.g. take X tablets X daily - where X was some arbitrary number which was accounted for in a (or multiple) reminders). Working with the OCR Java framework was quite difficult to implement into our personalized application due to various dependency failures - it took us way too long to debug and get the framework to work sufficiently for our needs. Also, the default OCR graphics toolkit only captures very small snippets of text at a single time whereas we needed multiple lines to be processed at once and text at different areas within the label at once (e.g. default implementation would allow one set to be recognized and processed - we needed multiple sets). The default OCR engine wasn't quite effective for multiple lines of prescriptions, especially when identifying both prescription name and intake procedure - tweaking this was pretty tough. Also, when we tried to use the Google Calendar API, we had extensive issues using Firebase to generate Oauth 2.0 credentials (Google documentation wasn’t too great here :-/). We’re proud of being able to implement a customized Google Cloud Vision based OCR engine and successfully process, parse and post text to the Google Calendar API. We were just really happy we had a functional prototype! Debugging is a powerful skill we took away from this hackathon - it was pretty rough going through complex, pre-written framework code. We also learned to work with some new Google APIs, and Firebase integrations. Reading documentation is also very important… along with reading lots of StackOverflow. We would like to use a better, stronger OCR engine that is more accurate at reading labels in a curved manner, and does not get easily flawed from multiple lines of text. Also, we would like to add functionality to parse pre-taken images (if the patient doesn’t have their prescription readily available and only happens to have a picture of their prescription). We would also like to improve the UI. 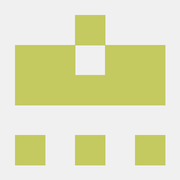 Simply download/clone the source code from GitHub link provided and run on Android studio. It is required to use a physical Android device as it requires use of the camera - not possible on emulator.